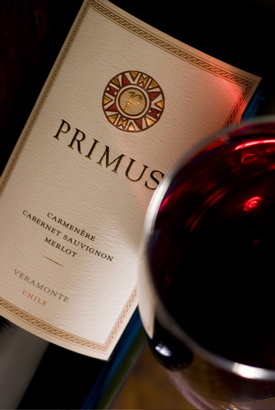 Colchagua Valley, Chile, this is a Meritage red wine with 65% Cabernet Sauvignon, 20% Syrah, 8% Merlot, and 7% Carmenere. When I opened it the other night, the aroma was beautiful, filled with what I thought were lilacs, while my guest thought tropical fruits or even Lychee. This is what I enjoy about tasting and enjoying wine with friends. People get different aroma’s and even different tasting notes. Just because someone else might get different from you, hey there is no wrong or right answer here when you are just enjoying wine. 14 months in French Oak, the flavors were of an exotic spice, some tobacco notes, dark rich fruit and powerful tannins. This bottle would pair great with Beef, Lamb, and Steak. I sampled it with a chocolate cake, yes it was a delightfully great pairing. This is not the kind of bottle I would enjoy with no food, it is too complex. Food only makes it that much better. This entry was posted in Chile, Meritage and tagged Chile, Meritage, Robert Parker, tropical fruits. Bookmark the permalink.